Louis Trevelyan met Emily Rowley when he was visiting the Mandarin Islands. Louis was a young gentleman of good fortune, and Emily was the daughter of the British governor of the Mandarins. It seemed like an ideal match—except for the fact that, as Emily’s mother observed, both of them liked to have their own way. The couple married and moved to London, with Emily’s younger sister Nora in tow. All was well for the first two years, but then Louis comes to suspect his wife of having an improper relationship with an old friend of her father’s, Colonel Osborne. He doesn’t exactly suspect unfaithfulness, but the appearance of unfaithfulness. Because both of the Trevelyans like to have their own way, neither will give in to the other. The situation gets worse and worse, leading to kidnapping, madness, and more. Although the story of the Trevelyans is established early on as the core of Anthony Trollope’s He Knew He Was Right, theirs is just one of several examples of the difficulties of Victorian-era courtship and marriage. The rest of the book focuses more on young people who are seeking—or not seeking—marriage. Emily’s sister Nora is torn between Mr. Glascock, a good man of great wealth, and Hugh Stanbury, an equally good man whose fortune is less certain. Stanbury’s sisters have no prospects, a problem that does not trouble Priscilla. She declares herself “unfit to marry,” adding that “I am often cross, and I like my own way, and I have a distaste for men.” Her sister Dorothy is simply resigned to her fate, not daring to hope something might be different until her maiden aunt Jemima, a powerful force in her own right, tries to arrange a marriage between her and the clergyman Mr Gibson. Dorothy likes Mr Gibson well enough, and she likes the idea of being Mrs Gibson, but does she love him? Meanwhile the sisters Arabella and Camilla French are doing everything they can to draw Gibson’s eye. Teresa: This is the fourth novel by Anthony Trollope that I’ve read, and with each of his books that I read, I grow to love his work more and more. I loved the scope of this book, the way Trollope looked at marriage from so many angles, showing how in almost every case, the traditional ways have worked against people’s happiness. There are the obvious cases of women having to rely on others’ whims for their very survival, but there’s also the notion that men must always stay within certain bounds, following certain expectations. There’s a sense, though, that the book is depicting a pivot point in the state of marriage, when either the old ways must fall away or the youth of England must live in misery. Jenny: I’m so glad you loved it, because I was just astonished by it. I’ve read two of the Barsetshire novels, both of which I really enjoyed, but this seemed like a book on another plane. Trollope looks not just at marriage but at courtship rituals and even single life from every angle: “trying to land a fish,” for instance, and the despair of women who can’t do that, because they have no other options; the agony of deciding between an eligible match and a man you love (or believe you love, having spent about ten solid minutes in his company); the slow strangulation of genteel poverty for the woman who cannot or will not marry; the voice of “strident” American feminism. And the writing! It was funny, touching, satirical, gentle. Teresa: I’ve heard this referred to as Trollope’s masterpiece, and I can certainly see why. As ambitious and sprawling as it is, it still feels focused because each storyline comes back to the state of marriage and singlehood. And Trollope does a wonderful job with the tone. Almost all of the characters, even the comic ones, are given a psychology and a reason for being as they are—and they’re given opportunities to grow and change. In fact, a willingness to change seems to be the key to happiness. I think especially of Jemima Stanbury, who is old and imperious and set in her ways. She’s cruel and self-centered, but not without soft spots. Those soft spots enable her to change her attitudes in a way that brings happiness to others, including herself. On the other hand, Trevelyan’s complete lack of malleability is what breaks him. He becomes a victim of himself—and even more tragically, he takes his wife and son and sister-in-law along. Jenny: That’s such a great observation. Even the lesser characters reflect this theme. Bozzle, the private detective (the character who seemed to have stepped directly out of a Dickens novel), was able to change his mind about his employer, and was almost redeemed by it. Miss Petrie, on the other hand, “the Republican Browning,” is unbending in her opinions, and is a far less attractive person for it. This book is really about the sin of pride, in all the forms that may take in society. One of the things I liked best about this book was how insightful it was about human nature. At the beginning of the Trevelyans’ dispute, Trollope takes care to point out the tiniest flaws: how tone of voice, ill-chosen words, or tiny self-deceptions can lead to hurt feelings, sprained dignity, misunderstandings, and — eventually — lives and loves broken and ruined. While my own relationships have thankfully never involved kidnapping or insanity, I know firsthand how true it is that tiny changes in tone make an enormous difference. Trollope absolutely nails this kind of thing. Teresa: Oh yes, Trollope does a wonderful job of showing how small missteps can grow and grow, especially when both people like to have their own way, as the Trevelyans do. I particularly loved how in those early chapters he shows that both Louis and Emily have a valid complaint and that both do wrong by each other. Emily’s relationship with Colonel Osborne is certainly innocent on her part, as she claims, but it’s not exactly what she makes it out to be either. But neither Louis nor Emily is willing to see the other’s point of view. As you say, it comes down to pride. But, oh, it was so frustrating to watch. Every time they seemed on the cusp of a break-through, some small action or word would tear it all to pieces. It was maddening! But I was glad that the book wasn’t all gloom and misery. I felt like Trollope demonstrated quite well how the traditional Victorian view of marriage was broken, but he also showed a way forward. And he showed that not everyone needs to make the same choice. It was a pleasure to read, well worth its length. Jenny: You’re right, both about the humor that leavened some of the more serious topics, and about its being a great read. I loved his women: they were so nuanced, so capable of both good and bad, not fitting into the ordinary roles women play. Trollope is such a good observer of people that I always feel I’ve left him understanding others better than I did before, whether those others are bishops or Bozzles. Yet another round of applause for the Classics Circuit, without which I would have taken much, much longer to get around to reading this wonderful book! 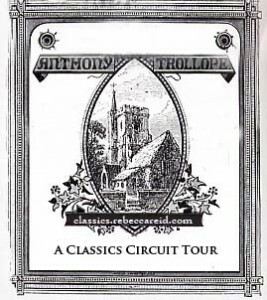 This post was part of the Classics Circuit’s Anthony Trollope tour. See the complete schedule for more on the works of Anthony Trollope. Sign ups for the next tour, which features the Ancient Greeks, is open until December 20. What a great conversation! I love Trollope but never read enough of him. I try to manage one book of his a year (which makes me recall I’ve yet to read him in 2010). I agree completely with what you are saying about the satisfyingly balanced nature of his characters – they’re good, they’re bad, they’re both right and wrong, and overall he is wonderful at mixing comedy, social comment and tragedy. Do you this this is why we return to the Victorians? Because they put it ALL in – as opposed to modern novels which are constrained to be singular in focus and can often come across a bit one-note? Excellent thoughts about the multifaceted nature of Victorian novels. I love the sprawling nature of so many Victorian novels. It makes me feel like I’m there and getting a true slice of life. I’m silently cursing Trollope for writing so many great books! I want to read so many of them after this blog tour. He’s beginning to take over my to-read list! It just occurred to me I could read nothing but Trollope for an entire year and still not finish his works. I had a similar thought myself! He’s so prolific, and his books are so long. If I were stranded on a desert island, I’d take the entire works of Trollope with me–that would take up some time (after I instructed George Clooney to construct a hut for us–ha-ha!) Anyway, I think Trollope is the best Victorian novelist; so much better than Dickens (who I don’t care much for) or even Thackery. If you haven’t read it, THE WAY WE LIVE NOW is absolutely wonderful–and still relevant today with its sinister Bernie Madoff-type character. Hee! Trollope would be a great desert-island author. It’s like getting four authors in one. And I’m with you on preferring Trollope to Dickens. Dickens is one of the rare Victorian authors that I don’t care for much. And I read The Way We Live Now last year and totally agree on its relevance. I must read some Trollope this coming year. 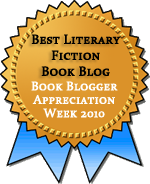 Hooray for Trollope in 2011! I love it when y’all do joint reviews! :) I’m still not convinced about Trollope though. I got so bored and frustrated with the one of his books I tried. We love doing them too! Which Trollope did you try? I found this one to be fairly entertaining and interesting the whole way through (aside from a couple of early chapters when the characters were just getting established). Great discussion, Jenny and Teresa. This is definitely going to be my next Trollope. Was it heavy on physical abuse the way THE WAY WE LIVE NOW turned out to be? I wonder if this would be a good novel to pair with George Gissing’s THE ODD WOMEN. I had actually forgotten how much physical abuse there was in The Way We Live Now until I read your review. I’d say here, though, that the bulk of the abuse was emotional (and some of it, tragically, does involve a child). I haven’t read the Odd Women, but I have a copy. Now I’m interested to see how the two compare. I’ve read the Barsetshire and Palliser novels plus The Way We Live Now, and loved all of them. I’ve had He Knew He Was Right on my list for some time, and your enthusiasm has sent it right to the top of the heap. Nothing could push Dickens out of my heart, but Trollope is so different that I’d make room for him on my Victorian shelf any time. I’m more of a Trollope fan than a Dickens fan, but I think Jenny is the opposite, and I’ve read neither as extensively as you have. I really want to read the Palliser books now. One of my college professors assigned us The Duke’s Children, which was my first experience with Trollope, and I’ve always wanted to go back and get the full story from the beginning. I’m glad you liked this one :) And yes, we did point out many similar themes! There’s been a lot of negativity about Trollope on the tour, mainly for some of his views (and slow pacing), but I think that at this point in his career, he was beginning to appreciate these issues a little more. Certainly, this book is a lot more nuanced than the Barchester novels (great as they are!). I’ve only read one of the Barchester novels, so I can’t compare, but I do wonder if the way he handled the changes in attitudes among some of the characters in the older generations in this book reflects his own changes in thinking. So many of them do come around after seeing how the old ways aren’t working and how things will change no matter what they say. As always, your joint posts are a pleasure! And I’ve yet to read a review that makes me so excited for Trollope as this one. Love what you say about pointing out how Victorian marriage customs were broken, and that the way forward must involve letting different people make different decisions. A subject near to my heart, and one that motivates me to pick up this novel in the near future! Thanks, ladies. Happy to point you toward a Trollope you might like! I really do think this novel depicts a sort of turning point, when attitudes had to change. Sounds fantastic. I am new to Trollope–reading Rachel Ray and very much enjoying it for the Classics Circuit. Now I’m trying to figure out which one to read next. Shall it be Pallisers or Barsetshire, Way We Live or He Knew? I have a feeling I am going to become another Trollope groupie. It is both exciting and terrifying to discover a new favorite who’s so prolific. And I’m glad you weren’t asking for advice because my answer would just be “yes,” all of them, which isn’t exactly helpful. Just to make it clear that I am not really asking that question for advice (although feel free to offer it)–just as an indication of how excited I am to read them all. I’ve read and loved many Trollope novels. I have hesitated to read this one because the BBC adaptation of it several years ago made the story seem a little one dimensional. 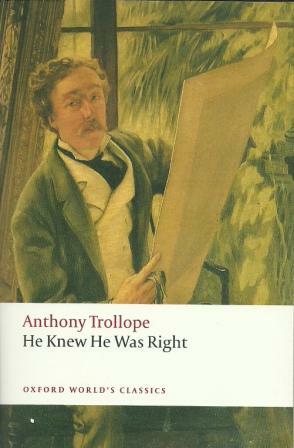 So it is interesting to hear two Trollope fans mention it as perhaps his best. I can see I need set aside my bias and give this one a try. I wasn’t even aware of the BBC adaptation until I saw it mentioned on Tony’s post, but as I was reading I thought it would make a good mini-series. It has David Tennant in it, which means I’m pretty much required to watch it now. I’ll be interested to see how it compares with the book. Oh, can I wait to finish the Palliser books before I read this one?! It sounds wonderful! I loved this, but I suspect the Palliser books are equally worthwhile. I really do want to read that whole series one day. A pleasure to read. I love your chat posts. I am in the early stage of discover with Trollope and look forward to getting my paws on a copy of this. I’ve enjoyed all four Trollopes that I’ve read, but this is my favorite (followed closely by The Way We Live Now). I’m not sure where I’ll go next with him, but it’s great to have so many choices.